To say we love going to Disney World would be an understatement. Well, I take that back. My kids and I love going but not so much Mrs. Debt Free. I’ve written several times about how spending money on experiences brings more happiness than buying stuff. If you’re looking for an experience to take your kids or grandkids on, consider taking them to Disney. I must forewarn you, Disney can be expensive and you must plan ahead to get the most out of it. Especially pay attention to the time of year you want to visit. Here’s a few fun facts for you: The average length of a Walt Disney World (WDW) vacation is now more than 6 days. There’s currently 4 theme parks, 2 water parks, more than 25 hotels, over 300 restaurants, shopping areas, golf courses, bus schedules, rides, shows, tickets. It’s a hopping place! As you can imagine, there are peak and down times and one of the secrets to doing this trip right is traveling during some of the slowest times at Disney World. Many moons ago, Mrs Debt Free and I were supposed to honeymoon in beautiful Jackson Hole, WY. Those plans were scratched when 9/11 hit. After tying the knot, we wanted to go somewhere as nice as we could afford within driving distance of Louisiana. Little did we know that the place we chose, Walt Disney World, was the #1 honeymoon spot in the world. Our 13.5 hour drive (we got to know each other VERY well), took us to Disney’s Grand Floridian Resort & Spa. I had no idea how much the resorts and parks had changed since first visiting when I was 12 years old. We loved The Grand Floridian and Disney so much that we started a tradition by bringing our boys annually once they were 3-4 years old. We initially chose to visit in October due to the great weather and Halloween party at the Magic Kingdom. Once they got a little older, we visited during Christmas and lucked out by seeing the awesome Osborne light display before it was removed to make room for Star Wars Land. Christmas at Disney is beautiful but EXTREMELY crowded (more on that later). If planning isn’t one of your strong traits, consider getting help from a Disney travel planner. If you’ve never been before, the entire process can be a bit overwhelming. When do I make hotel reservations? Which dining plan should I choose? When can I start making FastPass reservations? When trying to decide when to go, I wouldn’t recommend focusing on one single factor only. Instead, consider taking all of them into consideration. Take for instance the crowd levels. Low crowds during a time when temperatures are sweltering, humidity is high and there are no special events (such as Mickey’s Not So Scary Halloween Party) shouldn’t be chosen over dates with moderate crowds during a temperate time of year with a special event. One of the most important factors is what the trip is going to cost. If you plan on staying on property (which I STRONGLY suggest especially with small children), what you’ll pay for a hotel room can vary considerably depending on the time of year you travel. For example, the starting rate for a Deluxe Villa is almost $500 compared to a Campground stay at $55. We typically stay at The Grand Floridian which is in the Deluxe Resort category. Depending on time of year, rooms start at $300 and can go as high as over $900 a night. 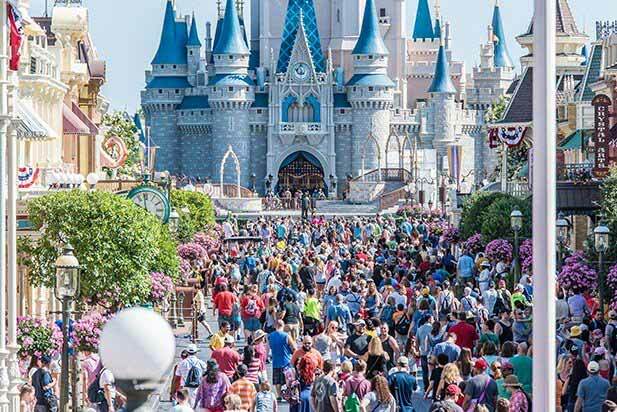 The second factor to consider are the Walt Disney World crowds. Each year, more than 50 million people visit WDW. It seems that Disney breaks their own attendance records each year so it’s more important than ever to have a plan for dealing with them. Our crew has visited the parks during all four seasons and have noticed that there is a major difference in the crowd numbers depending on the time of year you choose. If you have little ones, planning your stay to avoid the sometimes horrendous crowds is the most important factor to consider. There’s nothing worse standing in a 70 minute line in 100+ degree weather with screaming and cranky kids. The third factor in planning your trip is the weather. I’m from Louisiana so the summer’s heat and humidity don’t bother me. But for those that aren’t used to it, it can be miserable. If you’re traveling with small children, avoid the summer months if possible. If you can only travel when they’re on their summer breaks, consider picking a resort with a cool outdoor water area (most of them have several) or plan on visiting one of Disney’s water parks. We love visiting Disney during holidays such as Halloween and Christmas. Some of our families’ best times together have been during Disney’s busy season. All four parks are beautifully decorated along with most of the resorts. I sent my staff on a surprise Christmas Disney trip last year. One of the highlights of their trip didn’t even cost a dime. December 26-31 is the most crowded and expensive time of year. Crowds get increasingly bad starting about December 20 and running through the New Year. A few years ago, Mrs. Debt Free and I celebrated my 40th in August. As you can imagine, Orlando in August is VERY hot but it also helps with the crowd levels. Disney at this time of year has some of the lowest crowds and lowest costs available which make make it worthwhile visiting. Obviously Disney doesn’t like it when their parks aren’t filled which leads me to believe why they started offering their Halloween special event earlier in the year. Mickey’s Not So Scary Halloween Party is a great special event to take the kids to. Disney now offers the event in mid August (that’s right, Halloween starts in August at Disney). On certain nights, you can purchase a ticket to this event which allows your crew to trick o’ treat at certain areas in the Magic Kingdom. There is also a Halloween themed parade (Boo To You Parade) and firework displays too. If you do plan on going at this time, consider taking afternoons off and visiting water parks or resort pools. Trust me, your kids will love you for it. The second slowest time of year to visit WDW is the period after Easter up until Memorial Day. At my practice, we set annual goals each January. A few years ago, my staff hit their goal and decided they wanted to go to Disney during the Spring. I had never visited during that time so I tagged along as well. Spring weather in Orlando is awesome and you don’t have to worry about a hurricane ruining your plans like you do in the Summer and Fall. Epcot’s Flower & Garden Festival takes place this time of year. While the grounds at Epcot are always beautiful, the Flower and Garden Festival takes them to the next level. There’s also a wide variety of Disney character topiaries. No telling how long it takes the gardeners to construct these. Crowd levels during this time typically hover on the low end, averaging around 4-5 out of 10. The third slowest and best time to visit Disney World is after Thanksgiving through the first few weeks in December. Typically most U.S. kids are back in school in between holiday breaks and just like Halloween, Christmas starts early at Disney! Enjoying the awesome gingerbread house at the Grand Floridian. This is one of the most affordable times of year to visit and crowd levels hover around the 4 out of 10 mark. All four Disney parks and resort hotels go all out with festively decorating during the Christmas holidays. Similar to the Halloween party, Disney has a special event for the Christmas holidays that takes place in the Magic Kingdom. The weather starts to get unpredictable at this time of year. The first time we visited during Christmas, we didn’t account for the unpredictability and packed too lightly. Our weather forecast expected highs in the 70’s and low in the 60’s. Little did we know the night we attended the Christmas Party, Orlando was set to break record lows in the 30’s. Chilly! Unfortunately, the two weeks of December is not what it once was regarding crowd levels. Too many have boasted about this being the time of year to visit and now the secret has gotten out. The cool thing is that the crowds are still nowhere near as bad as other peak times, but it’s no longer the ghost town that it once was. Low crowds, Christmas decorations and entertainment are the big highlighted attractions. Once you go during Christmas, you’ll never want to visit at another time again! If you’re a member of the FIRE community and want to do Disney right, never fear! Our good friend over at the Physician On Fire tells us how to enjoy Disney no matter what your budget. It can be a lot of work to figure out the best time to visit WDW based on the three factors discussed: Crowd, Cost, and Weather. Again, consider using a good Disney Travel Agent to help you with the planning and booking. They’ll know the best dates and times and how to choose the best dates to save the most money. When do you like to travel to Disney? If you're not using Personal Capital yet, sign up today. It's one of my favorite resources! Hi Mike, I’m glad you’re enjoying the DFD World. Maybe that can be the next WDW? Ha! Yes, we’re a fan of the Mouse and considered DVC, Disney’s Vacation Club when our kids were smaller. Now that they’re older, it would make sense for us to join as they like to go other places now. Star Wars: Galaxy’s Edge is opening at the end of August, so there will be NO light days for at least the next year. They’re suspending renovations to the resorts as those typically take a portion of rooms offline for a period of time.